The Bowflex Treadclimber TC5000 model is the result of merging a traditional treadmill and an elliptical. It looks similar to a treadmill except that the footboard is divided in half and each moves opposite the other up and down on hydraulics in a motion similar to an elliptical. The Treadclimber has a nice speed range from 0.7 to 4 mph with 12 resistance levels. It has 8 electronic functions including: total steps, calories per minute, total calories, speed, distance, time and climb indicator. It also has an integrated heart rate monitor. It comes with a warranty that covers the motor for 5 years, the electronics and other parts for 3 years and hydraulics for 2 years. Its dimensions are: 46 inches long by 30 inches wide by 55.25 inches tall and weighs 185 lbs. You should expect to pay about $2,185.00 for a refurbished model on Amazon.com, although you can get them used for less. The nice part about this machine is it allows you to have a low-impact workout with the fast results of a high impact cardio workout, so it is good for people who cannot run or have joint or other health problems. Most people who like this machine are impressed by the workout they get from it in the short amount of time they use it. This also has wide footboards to allow for a comfortable, safe stride. It has a bright LED display that is easy to read and see in dim light. The Treadclimber is slightly smaller than traditional treadmills and elliptical machines so if you don’t quite have space for either of those, this is a good machine to consider. The wireless heart rate monitor is an easy way to continually monitor your heart rate as you exercise, so you don’t have to slow down, stop, or find a heart rate button. The electronic functions enable the Treadclimber to remember your last weight and resistance settings for a quick start to your workout. The movement of the footpads also means that you don’t have to workout for as long to see the same results as you would on a treadmill. There are a few drawbacks to the TC5000. You will have to assemble the machine yourself and this may require another person to help. The assembly will also take some time so set aside a couple hours. The Treadclimber is large compared to some other exercise options, such as bikes and is also heavy, so moving, assembling, storing and using this machine requires some space and strength. This will also make some noise similar to a treadmill, however a few people have noticed other noises from moving parts which develop. These may be fixed with silicon spray so you might want to have some on hand. 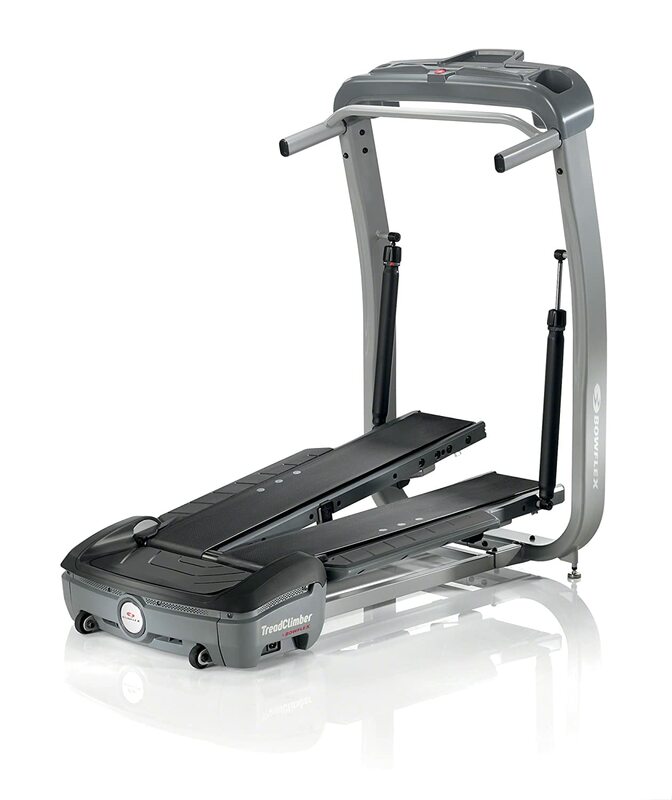 Also compared to competitors such as treadmills and ellipticals, this machine is more expensive. Finally, if you do need replacement parts you will have to install them yourself. Although there are a couple of drawbacks to the Treadclimber TC5000 such as the weight and assembly issues and the possibility of some noise problems that may arise with use. As well as the fact that the cost is typically more than a standard treadmill or elliptical. However, the Treadclimber does offer advantages of both such as the belt-style forward movement and incline offered by a treadmill and the up and down movements of a low-impact workout offered by an elliptical. The Bowflex TC5000 makes an excellent workout choice due to its low impact style and quick results. The electronic functions make it easy to use and its slightly more compact size means space will be less of an issue than if you want an elliptical or treadmill.